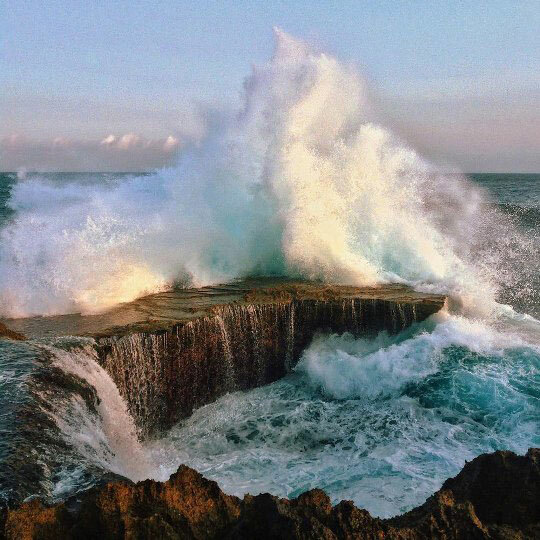 Nusa Lembongan is Bali's little neighbor sitting across the Bandung Strait and represents, for many, Bali's top diving destination. 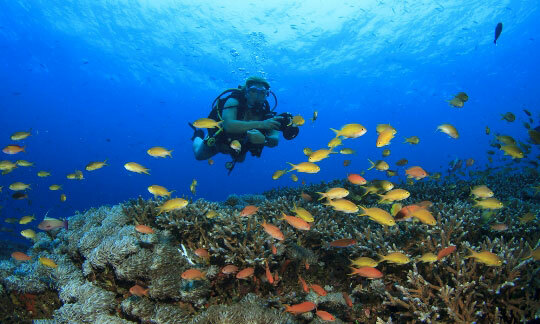 There are many reasons to stay in Lembongan and dive the surrounding area. These include fields of pristine coral, manta rays and beautiful drift dives, but the main drawcard is the chance to dive with mola mola. 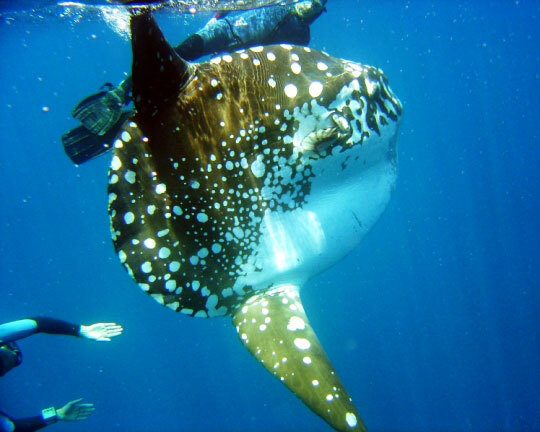 In season, meaning July to September, you can dive with the amazing sunfish at various sites around Nusa Penida and Lembongan. Coming close to these big, weird-looking creatures is something you won't forget. 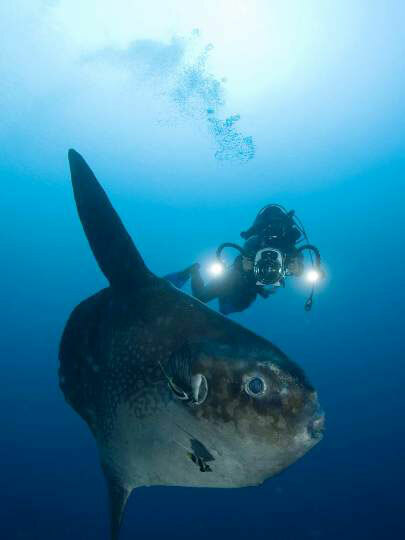 Dive sites like Blue Corner and Crystal Bay represent great opportunities for encountering the mighty sunfish. Other sites like Manta Point and Ped offer good chances of having manta rays sweep around you as you stare in wide-eyed wonder. 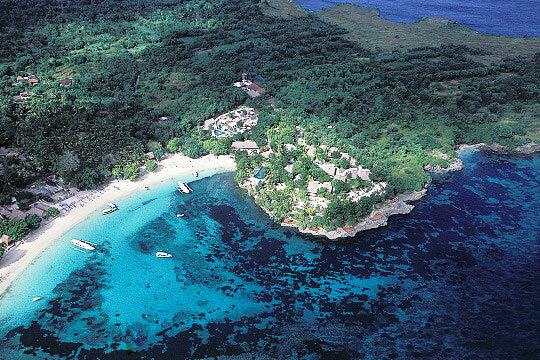 There are also some good snorkeling sites such as Blue Point which can be enjoyed by both scuba divers and snorkellers. 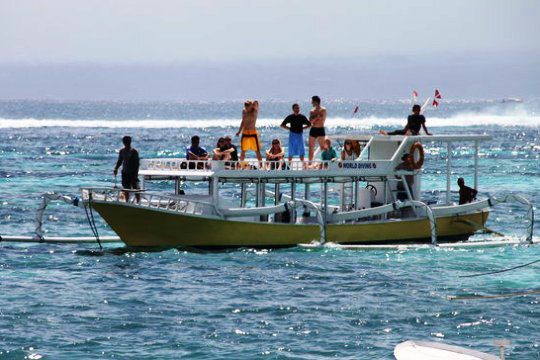 [More information on these dive sites: Lembongan and Nusa Penida]. 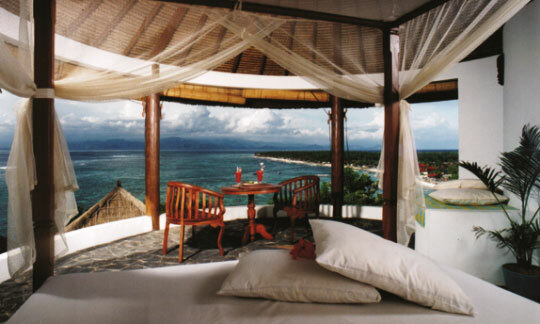 Lembongan Island is a smaller more laid-back version of Bali. You don't need to worry about traffic jams or thronged, narrow streets here. Instead you can get a feel for how Bali was decades ago, with a relaxed, easy atmosphere, making it the perfect holiday destination to unwind. Choose from a wide-range of options, including high end beach resorts, private villas and hotels, bungalows and guesthouses to suit all budgets. hotelscombined.com, our affiliated hotel reservation agents, have a good choice of accommodations in Lembongan to suit all divers' tastes. Make your choice and book from their full range of Lembongan resort options on their website and simply book with your credit card. If you have any questions you can make use of their on-line chat. Thanks to their 'Low Price Guarantee', you can be sure you are getting the best value-for-money whatever option you choose. Whichever option you choose, stays of 1 week are ideal. 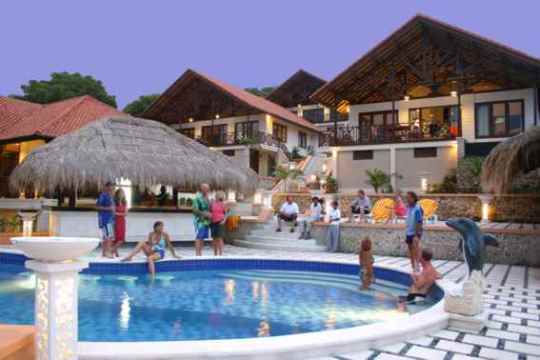 Packages normally include scuba diving, drinks and lunch. 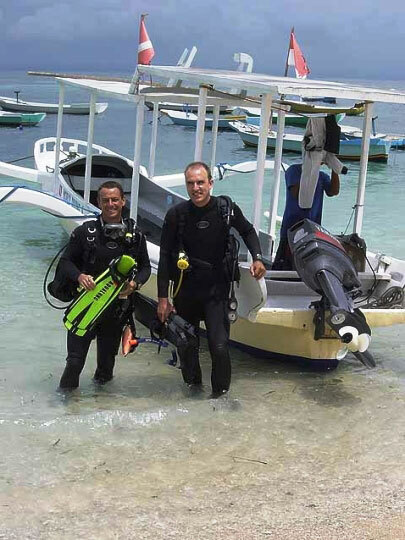 The dive season in Bali, and therefore Tulamben, is year-round. So it is never a 'bad' time to be heading to Lembongan. 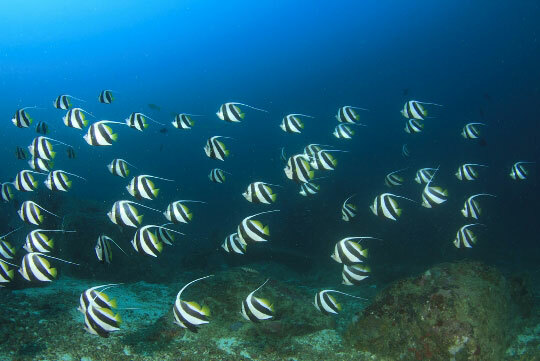 December to March is considered rainy season so there tend to be fewer divers around, even though most days are absolutely fine, with maybe a reduction in visibility being the biggest issue. Water temperatures hover around the mid 20s celsius, dropping a few degrees during July to September when the mola mola are likely to be in town, and when sharks and other large pelagics are more often around. 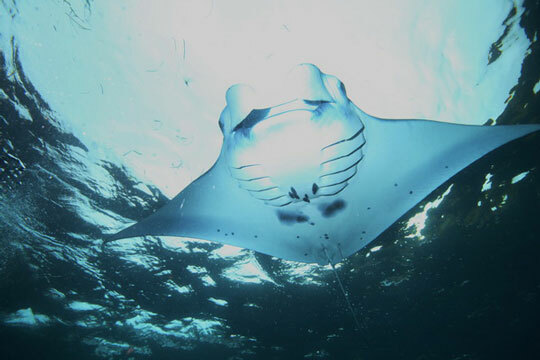 Many divers encounter both sunfish and manta rays at Lembongan. Although mantas are more frequently sighted between April and June, you can be lucky with mantas at any time during the year. 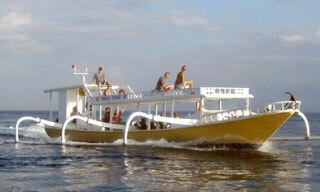 To get to Lembongan Island, off Bali, we recommend the door-to-door service of Scoot Cruise . Scoot will pick you up from your hotel in Southern Bali, transfer you to Lembongan in around 30 minutes and drop you and your luggage to your accommodation on the island. Transfers can be arranged and paid on arrival. The convenience of this is known only by those who undertook the 2½ hour journey before this service began. These slower and less comprehensive transfer options are still available. 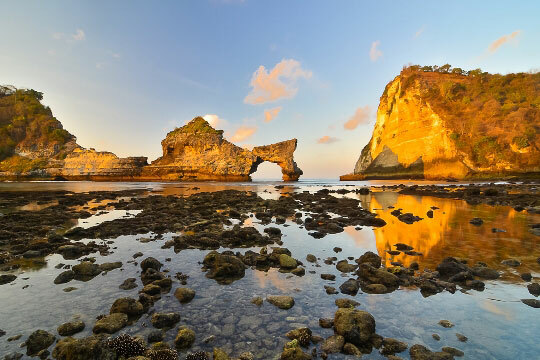 See our Bali travel information section for details on how to get there. 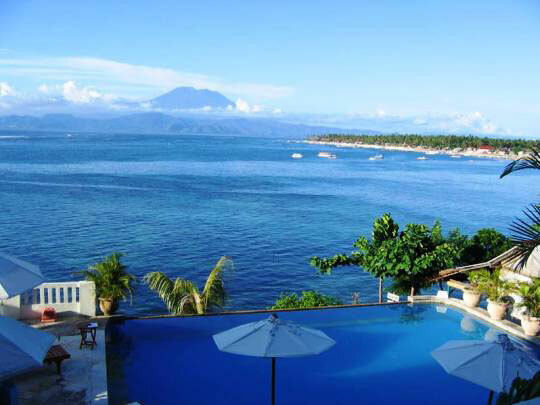 While Bali has an unlimited number of sights to see and things to do, Lembongan is a much more low-key destination. That is not to say you cannot fill your non-diving days with lots of fun activities, although they tend to be natural wonders rather than shopping and temples. You can visit the Devil's Tears, where big waves crash dramatically against the rocky shelf of shoreline, making for inspiring photographs. 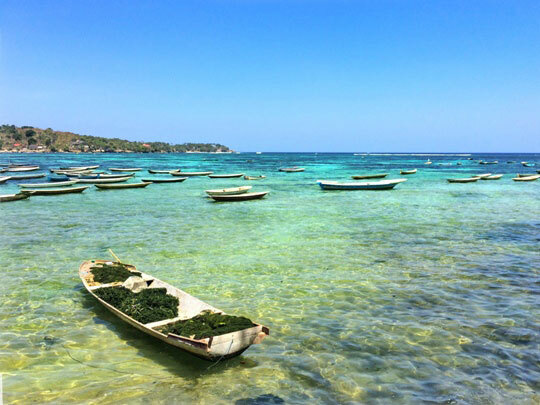 Enjoy the sights of Jungut Batu beach and watch the locals busily harvesting seaweed from the shallows as happy little children run around flying their kites. Motorbikes are available for hire, and you can tour the island, most notably the mangrove forests, or snorkel or kayak through them and enjoy the quiet natural surroundings. There are also some good surfing sites, and indeed many tourists come here to surf rather than to scuba dive. 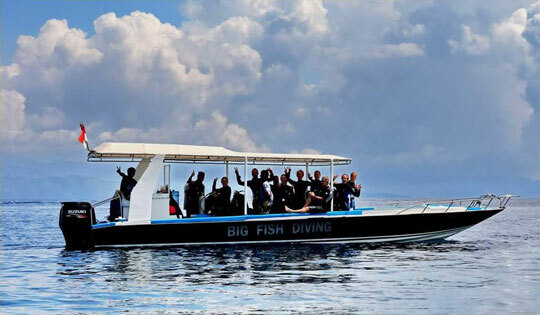 Visit our Bali tourist activities page for a more comprehensive list of fun tourist activities. Most tourists dine in their own resort when staying in Lembongan since there is no main street lined with restaurants. It simply is not that kind of place. However, if you are keen to explore other dining options, you can stroll from one small resort to the next and drop in to order from their menu. Most resorts are welcoming to drop-in diners. You will encounter a range of international fare, with an emphasis on seafood, as well as a number of tasty Indonesian specialties. Beyond the occasional simple 'warung' selling sundries or a tourist stall selling simple souvenirs, you will not find much in the way of shopping options on Nusa Lembongan. It is part of the laid-back charm of the island that it is free of retail outlets. Ferries transport you to the island from Sanur and, once you are on the island, motorbikes are a good option for getting around if you want to cover any distance. 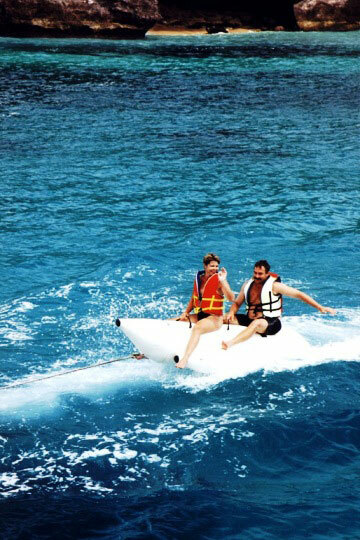 Most guests stroll around the shoreline walkways or arrange boat transport from their resort.